Succulent pork sat on a bed of creamy beans and crispy salty bacon. 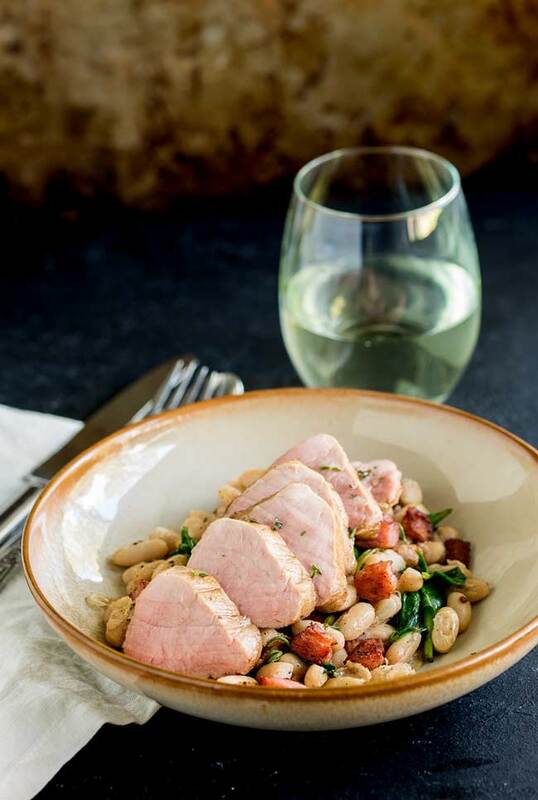 This Pork Tenderloin with Beans and Bacon is delicious, comforting and oh so simple to make. Plus it looks elegant, which makes it perfect for easy entertaining. 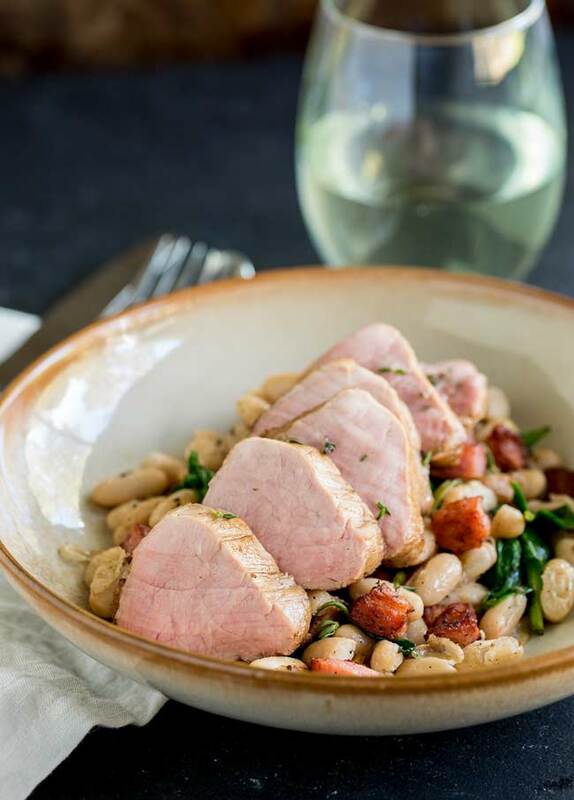 This simple main course is such an elegant way to serve beans, thanks to the pork tenderloin. Succulent and juicy it lifts the simple beans and bacon to another level. For other Pork Tenderloin Recipes, check out our Pork Tenderloin with Roasted Strawberries. Pork tenderloin, also known as pork fillet, can be notoriously hard to cook. So often it is served over cooked and dry. And no one wants to eat chewy overcooked pork. In the recipe below I have given two ways to cook it. Quick roasting which if done right gives juicy succulent pork and sous vide which gives fabulous results every time. I love my sous vide machine, if you are a keen cook and love succulent meat then I would definitely ask Santa for one! But as I know not many people have them, I have tested this recipe a couple of times with the oven roasted method. As long as you cook it quickly and let it rest well you will still get juicy succulent pork tenderloin. The recipe calls for white beans, you can pick your favourite or use whichever if easiest to find. Here cannellini beans are always available, but any white bean will work. The key is to drain and rinse them first and heat them in the bacon fat with a touch of chicken broth. This warms and softens them without letting them go mushy. You can see from the photo below that the beans are holding their shape, have a little bit of colour and look ready to eat. As with so many dishes on my site, all the ingredients can be found in the supermarket and although the dish isn’t complex it is perfect for entertaining. Plate it beautifully and your guests will be wowed. I recommend a deep bowled plate, pile the beans and bacon up and then top with slices of the juicy pork tenderloin. Simple, elegant and delicious. Pin this recipe for Pork Tenderloin with Beans and Bacon. Pin it here. 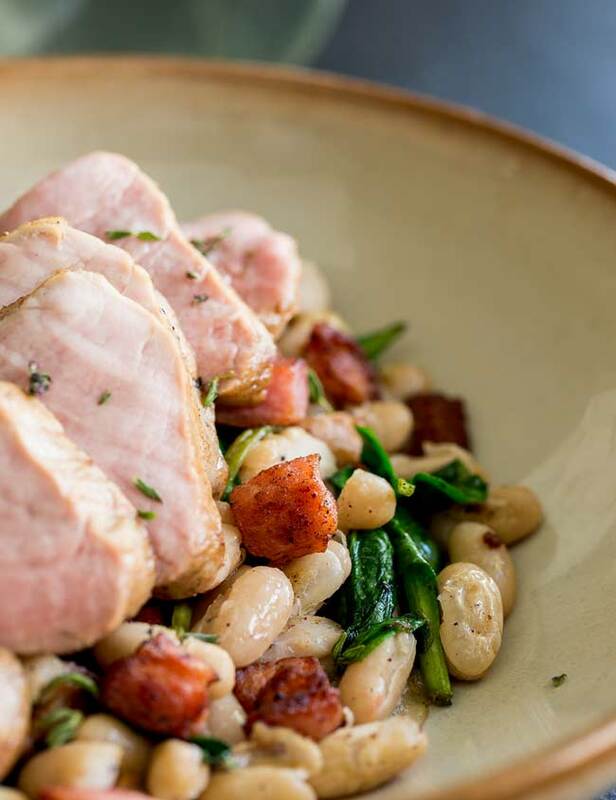 Pork Tenderloin with Beans and Bacon | Succulent pork sat on a bed of creamy beans and crispy salty bacon. This Pork Tenderloin with Beans and Bacon is delicious, comforting and oh so simple to make. Plus it looks elegant, which makes it perfect for entertaining. Trim any silver skin from the pork tenderloin. Pat the pork dry with kitchen towel. Season the pork generously with salt and pepper. Pour in 1 tablespoon of the oil and when it starts to shimmer and smoke, add the pork tenderloins and brown on each side for 1 minute as side. Remove the pork from the oven and transfer to a warm plate, tent with foil and leave to rest whilst you cook the beans. Season the pork with salt and pepper and then seal in a vacuum bag. Place in your water bath and cook for 60 minutes. Remove from the water bath and sear in a smoking hot skillet. Peel and finely chop the shallot. Set to one side. Add the remaining tablespoon of olive oil to the skillet (no need to wash) and then add in the chopped bacon. Place over a medium heat and cook for 5 minutes until crispy. Add in the chopped shallot and stir to coat in the bacon fats. Turn the heat up under the skillet and add in the drained beans. Stir together gently over a high heat. Add in the chicken broth and allow it to sizzle away until the beans are heated through, don’t stir too often so you don’t break the beans. Once the broth has almost gone, stir through the spinach and remove from the heat whilst it wilts. Spoon the beans into deep plates or shallow bowls. Cut the pork into thick slices and arrange on top of the beans. If you can find a block of pancetta then use that if not the packets of cubed bacon are perfect here. Nutritional information is based on this dish serving 4 people. But with an appetizer and dessert this would easily serve 6. This looks like such a great dish. 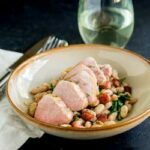 My kids are getting more in to beans so I am always on the lookout for more ideas they might go for, plus ideas for pork tenderloin are always welcome too. I hope the kids enjoy the beans. This just made me realize that I don’t cook enough pork !! Beautiful pictures and love the idea of pairing it with beans . I love your easy to follow instructions. Nice job!